Increase circulation to the sensitive area of the knee. It is also ideal for use on knees that have experienced a strain, as the gentle compression speeds up the healing process. The durability of the knee support is impeccable, it will endure much use while showing little sign of wear. None of these advantages come at the cost of comfort, it is as comfortable as anything you will ever wear. 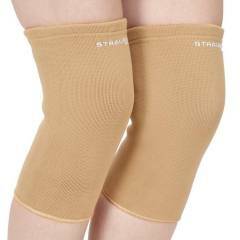 Strauss Cotton & Nylon Beige Knee Cap Support is a premium quality Knee & Ankle Braces from Strauss. Moglix is a well-known ecommerce platform for qualitative range of Knee & Ankle Braces. All Strauss Cotton & Nylon Beige Knee Cap Support are manufactured by using quality assured material and advanced techniques, which make them up to the standard in this highly challenging field. The materials utilized to manufacture Strauss Cotton & Nylon Beige Knee Cap Support, are sourced from the most reliable and official Knee & Ankle Braces vendors, chosen after performing detailed market surveys. Thus, Strauss products are widely acknowledged in the market for their high quality. We are dedicatedly involved in providing an excellent quality array of Strauss Knee & Ankle Braces.